→ The difference between similar looking two different words Quality Assurance and Quality Control are mentioned below in five different categories. → Quality Assurance is Prevention Control. → Quality Control is Detection Control. → Assurance means giving a positive declaration on a product which gives confidence for the outcome. → It gives a surety that the product will work without any problems as per the expectations or requests. → Quality Assurance is focused on preventing defect. → It ensures that the methods, techniques, and processes are designed for the projects are implemented correctly. → It is a proactive approach and is prevention control. → Control is to check or verify the actual results of the product or process by comparing with the defined standards or specification. → Quality Control is focused on identifying a defect or mitch match of the specification as compared to a defined specification. → It ensures that the methods, techniques, and processes are designed in the project are following correctly. → It is a reactive approach and is detection control. → It is a set of activities which ensures the process for good output." → It is a set of activities which ensure the quality of product either it is good or bad. → It is focused on the prevention of defects. → It is a proactive approach that means it works before product made. → It is focused on the identification of defects. → The goal of QA is to develop a robust process so that the defects will not generate. → The goal of QC is to develop the product checking method so that the defects do not pass to the customer. → Everyone from supplier to dispatch team (all team member) are responsible for that. → Usually, a specific team is responsible for testing of product for defect before pass it to the customer. → Process verification is an example of QA. → Product validation/ Product testing is an example of QC. 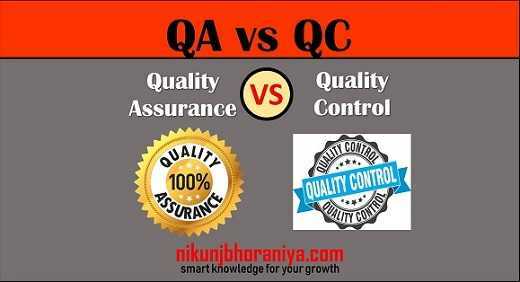 It's really good example for difference between to QA Vs QC. Thank u. It's really help me lot..
Ok thank-you for your valuable feedback. It is helpful knowledge for all quality people. Clearly we can understand thank you so much for valuable information..
What do you think about Product Test in QC or QA. Because you can also make prodcut test for realibility or durability test for product. These kindd of product test in QA in my opinion.